Airtel today announced the availability of its 3G services in 42 more towns of Madhya Pradesh and Chhattisgarh under the second phase of roll out. Airtel 3G services will now be available in a total of 54 towns of Madhya Pradesh and Chhattisgarh after the successful roll out in the second phase which covered Ratlam, Sagar, Satna, Rewa, Burhanpur, Khandwa, Ujjain, Harda, Bina, Singrauli and Sejbahar. Airtel mobile customers will now be able to experience the Airtel 3G advantage and enjoy a host of innovative service capabilities including fast mobile internet access, Mobile TV, video calling, video streaming and social networking at anytime, from anywhere. Airtel also offers high speed USB data cards that provide customers with 3G access on laptops.Airtel 3G customers can enjoy the benefits of 3G speeds on the device of their choice – be it their mobile handsets, tablets and on laptops connecting using the Airtel high speed USB data cards. Airtel provides its customers with timely updates and alerts on their data usage helping them control their expenditure on 3G and enjoy a seamless experience. The company has also introduced a first of its kind ‘Internet Usage Calculator’ available online to help customers analyse their current internet data usage and choose an Airtel 3G plan accordingly. 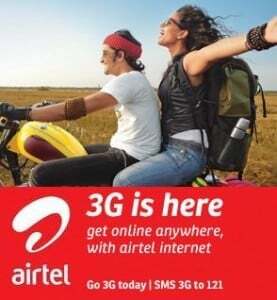 To know more or join Airtel 3G services – customers can visit http://www.airtel.in/Airtel3G/ or call 12134 (toll free) or SMS ‘3G HELP’ to 121.